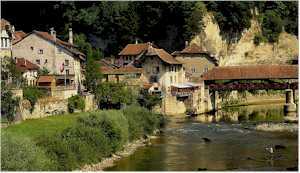 ABOVE: Fribourg, on the Sarine river, is a medieval town and the home of Switzerland's only Catholic university. Its youth hostel is in the city center. Youth hostels are great bargains in Switzerland and Austria, where currencies are strong and hotel prices tend to be high. They're also convenient, thanks to a network of more than 70 hostels in Switzerland and another 93 in Austria. Hostels fall into two broad categories: nonprofit hostels that are run or recognized by national hostel associations (see links below), and private hostels such as Balmer's in Interlaken, Switzerland. Don't let the term "youth hostel" deter you if you're over 21. Swiss and Austrian hostels have no age limits, and their guests range from students to senior citizens to families. Today's hostels are also more appealing than the barracks-style accommodations of 20 or 30 years ago. In Switzerland, virtually all hostels have two- or four-bedded rooms, while most Austrian hostels sleep two to six guests per room. What's more, Swiss hostels are now open 24 hours a day, as are most city hostels in Austria. The days when you had to check out in the morning and check in again in the evening are gone in these two hosteler-friendly countries.